Join Rachel Chase, Expressive Arts Facilitator and Creativity Coach for this memorable and transformative experience at the beautiful Atlantic Center for the Arts main campus! Enjoy a day of slowing down, taking time to see with clarity, and give pause to experience the preciousness of your unique gifts. Connect with the moment. Draw out your inner wisdom, your muse, your soul’s voice. You are Artist. Your life is your art, your creation… whatever your media; be it fine art or any way of expressing artistry – crafty homemaking, cooking, gardening, martial arts, parenting, making music, or even singing in the shower. Bring your heart longing to embrace the next flow and give your imaginal cells the juice they need for fertile growth. 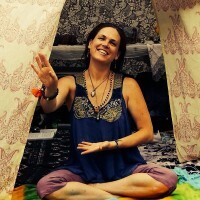 Trust Rachel to safely guide your personal process of clearing your blocks and feeling open to express yourself freely. Play with clay to bring form to your voice’s inner call. Draw our your inner vision through spontaneous drawing. Create beautiful collages with word art. Let the renewal of Spring carry your Creative Spirit forward. Move your body with gentle movements, and enjoy special meditations for artists. Experience group sharing and support. Bring your vulnerability to the fore and let your courageous heart be free. Think of this experience (with other brave artists) as your personal catapult to charge your fire and bring out your inner expressive nature in powerful and insightful ways. The glorious energy of Atlantic Center for the Arts will provide us with the space of grace we need to incubate your visions and nourish them with a new spark of light to illuminate their fullest expression. This mindfulness-based creativity workshop will leave you feeling inspired and ready to birth your next project, take the next step in your endeavors, and let your truth be seen/heard/known/felt. $65 / ACA members $50. Limited to 20 participants. Secure your spot now! Rachel Chase has been a teaching artist since the age of 15. She began expressing through dance. First a classically trained ballerina, then a semi-professional modern dancer studying with the likes of Alvin Ailey dance company, and dancing professionally in the Orlando area; as well as trained in theater arts. She received her undergraduate degree from the University of South Florida with a bachelor of fine arts, integrating video art and performance, as well as painting and printmaking. Rachel has continued teaching movement and art to children and adults in community settings for over 15 years. She is currently working toward her Master’s degree in mental health counseling. As a therapist, she continues using expressive and visual arts as therapeutic processes, assisting others on their journey to well-being and wholeness. It is the power of play and creative expression that have always propelled her life into new and uncharted territory. She is constantly creating, and has a passion for consciously creating community. Join her in this ever-evolving process of intuitive creation.